This entry was posted in Stocks Reservoir Fishing Reports on October 30, 2010 by Ben Dobson. Sport: With the cold weather definitely with us now the fish are tight in to the margins and chasing the minnows, so its time to get the Minkies and zonkers out. Chris Harrison had 4 fish from the bank taken on a black lure. From the boats top rod was John Hood who found Minkies cast right onto the bank and the drawn off to be the best method. There are fish still rising although they are not keen to take dries. But this does show that the trout are not too deep. This entry was posted in Stocks Reservoir Fishing Reports on October 23, 2010 by Ben Dobson. It’s been an up and down week so far at Stocks with the fish now back in the margins. Top patterns are certainly Orange lures and Damsel variants. From the shore the fishing has been most productive from Bell Point and along Hartley’s. From the boats Frank Hartley found three good blues around Gull Island earlier this week and I am sure with the near full level those fish will be in amongst those willows. We stocked another 200 blue trout last night and another 100 or so rainbows, and as regulars will know this can often stir up the resident fish. The fishing has not been easy this week but the weather is a lot more settled as of this afternoon and I am sure we should have some good catches this weekend. If you are fishing from the boat take advantage of the light wind and let your boat drift the margins, try some fry imitations on slow sinking lines and play around with the retrieve. Orange, silver, black and yellow. This entry was posted in Stocks Reservoir Fishing Reports on October 15, 2010 by Ben Dobson. Mark Abram with his 25lb 12oz bag of 4. He caught these two cracking rainbows and two blues on an orange nobbler. 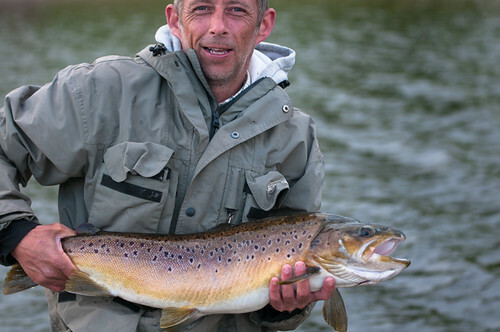 This entry was posted in Bank House Fishing Reports on October 13, 2010 by Ben Dobson. This entry was posted in Bank House Fishing Reports on October 10, 2010 by Ben Dobson.